I had a great dive on Saturday with Greg & Dave (last names withheld to protect their prospects for future political office). We had a good time diving but it also brought to light a great reason to get local diving in. Here’s something to think about before you turn your nose up at a local inland dive. About a week ago one of the divers that frequents our local dive shop asked people to go diving with him so he could test out his new dry suit before flying off to California for an underwater photography class (totally NOT jealous… at all… not me…). I’ll be honest, I almost didn’t go. I knew the water would be pretty cold this time of year and to be fair I’m busy to the point of stupidity with work. Then I realized there was no better reason in the world to go diving with a couple of friends than to get even a short break (36 minutes) from the hustle and bustle of my everyday life. First of all – I was right! Getting some dive time in was relaxing, grounding and gave me a chance to center my thoughts. If you’re a diver you probably already know what that’s like. SCUBA can be like a week’s worth of mediation for me. Secondly – I had made some changes to my setup and learned a few things that will improve my diving experience in the future and I thought I’d share those with you so that when you make changes to your setup or buy new gear you’ll consider making a few checkout dives locally. Then when you take off for that diving paradise on your next trip you’ll have confidence that you know what you need to about your equipment and that everything is working properly. My Airsource (integrated alternate 2nd stage regulator) doesn’t like 48F water. While it’s common to consider whether or not your primary regulator will function in cold water ; less common is the consideration of whether or not your inflator/deflator is going to work properly. While I have poseidon regs I purchased for tech diving, I didn’t change out my rig for this dive. The inflator/deflator buttons on my Airsource became pretty sticky after a few minutes in the water. Since we didn’t change depth much (max depth 24ft) it wasn’t a big issue but it’s good to know that if I’m going to dive in water that cold I will have to contact my local dive shop and see if the Airsource can be adjusted or if I need to pull out the Deep Outdoors backplate and wing. Shoulder mounted GoPro was too high and hose interfered. I tested out the camera position with my BC on and the camera in place when I set it up at home. The problem? I didn’t think about the regulator hose (as clearly obvious in the video). As a diver I’m glad to know about this now so that future dives (like on a reef maybe) will have better footage. As an instructor I like knowing that the footage I get for students as they complete their open water training and become part of our SCUBA pod, will be of them and not of my 1st stage hose. GoPro 3+ wasn’t set to ProTune. As you watch the video you’ll see the color going from somewhat ‘normal’ to crazy green and yellow. That would be my GoPro 3 Black set to ProTune (shoulder mounted camera) which came out great vs. my GoPro 3+ Black set to NOT ProTune which came out… meh… less than meh really… I guess -meh. Suunto D4i Novo & DM5 Software. This was my first dive on the D4i. After over a decade of loyal service my Mosquito finally flooded and died. I did try to resurrect it but alas it was not to be. Anyway, the D4i Novo was easy to dive but I’ll have to get a few more dives on it before I comment further. What I do want to mention is that Suunto’s DM5 Software works great on my Mac. If you are a Mac user you’ll probably be aware that support for our super awesome computing platform by the dive community is well… not super awesome. At first I was searching for specific fields for each item of gear to check off etc. However, Suunto has opted for tags and a single description field. Once I got my head around that I realized how much faster my workflow is for entering my dives. 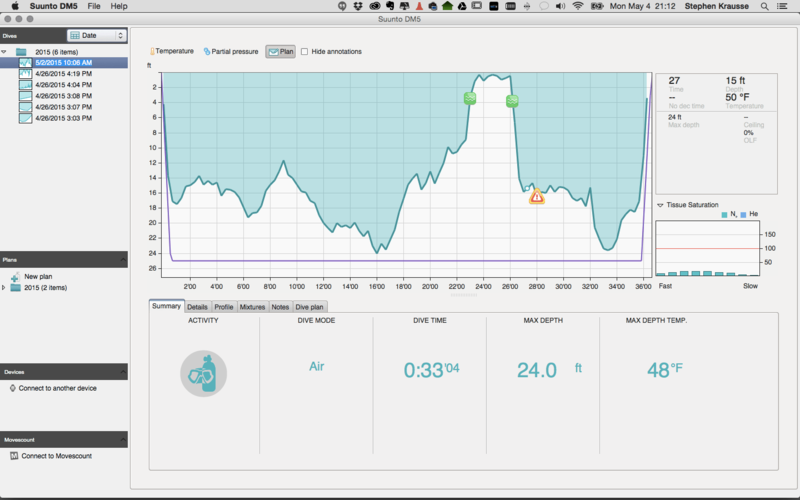 I love it – dive logging that doesn’t hate my Mac! 20 lbs is not enough. The last dive I had in my drysuit I used my thin Fourth Element thermal layer which was fine and with 20 lbs of weight I was about right. When I added the heavier Arctic clothes (also Fourth Element) I discovered that another 2-4 lbs would have been a good weight. A good dive with good dive buddies and a bucket of great information for me to improve my next dive. What did you learn on your last dive? Leave a comment and let us know! ⟵Don’t let something as simple as a mask strap ruin your next dive!